Welcome to the 8th edition of my e-newsletter (July 2015). This has been a busy month with some passionate debate about the future of the Frome Street Bikeway and the Royal Croquet Club. Welcome to the 6th edition of my E-Newsletter! This has been an interesting month on Council, with the announcement of the retirement of our CEO and a debate about the use of the parklands for circuses featuring live animals. I have decided to issue e-newsletters on a monthly basis (with regular updates provided on my website between issues). Does this work for you? Please do let me know what you think! Welcome to the 5th edition of my E-Newsletter! During March I’ve had the opportunity to soak up the festival season and I continue to be impressed by the talent and enthusiasm of the arts community in our city. 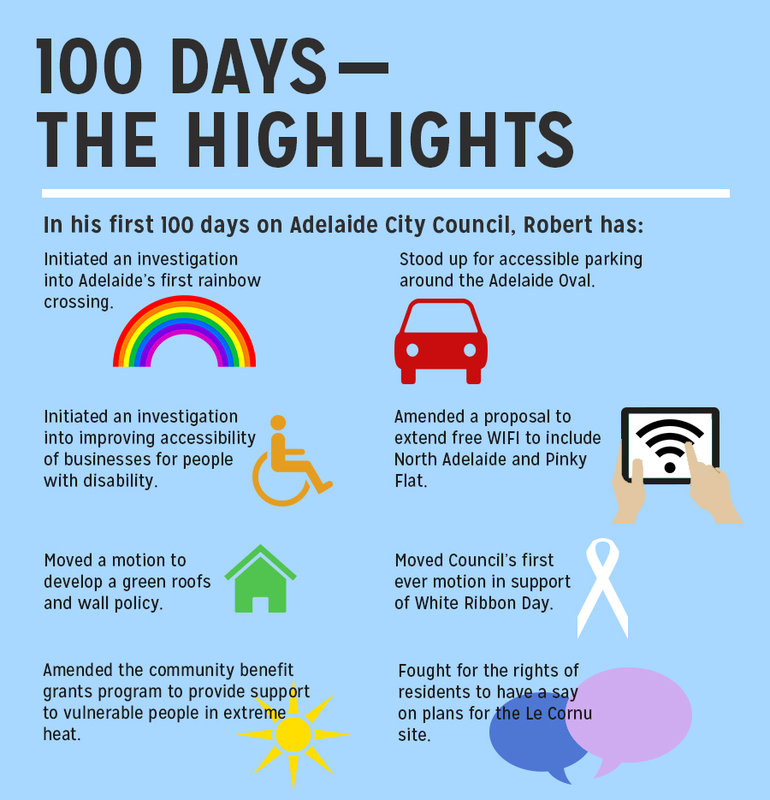 Council recently clocked up 100 days in office. The above graphic highlights some of the things I’ve been working on since my election last November. My thanks to everyone who has supported and encouraged me on the journey so far! Welcome to the 4th edition of my E-Newsletter! This month has been busy but productive. As foreshadowed during the election campaign, I have been advocating for improved disability access in the city – initiating an investigation into a range of options to encourage businesses to make their premises more accessible. 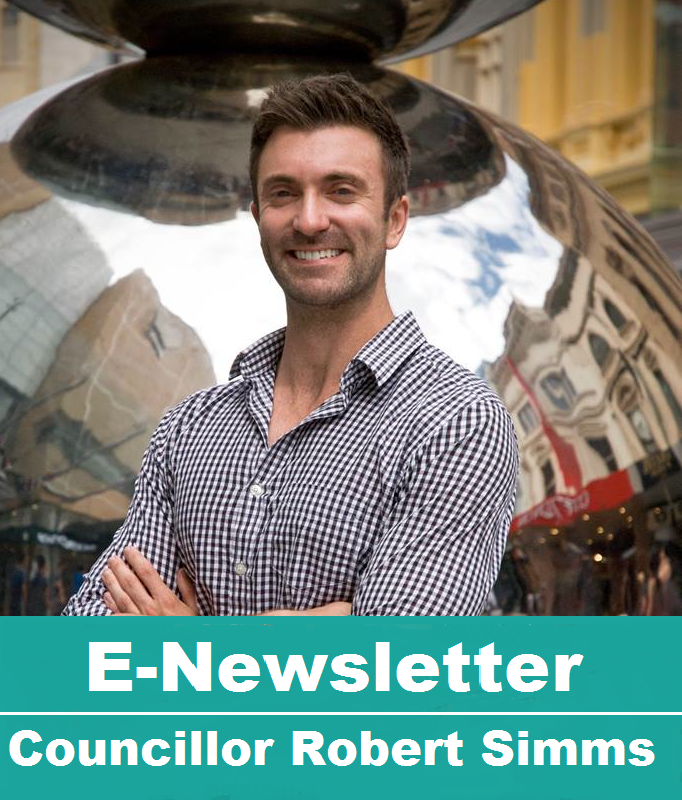 Following some community feedback, I have made changes to this newsletter – providing more information on the outcomes of Council and less on activities and events. Please do let me know what you think! Welcome to the first edition of my E-Newsletter for 2015! January has been a busy month and I have pursued a number of initiatives to make our city more inclusive. In particular, I’ve been looking at a new icon to celebrate diversity and the provision of increased support for homeless people during extreme heat.